Pardon My Pink Monarda Bee Balm is a great new Proven Winners Perennial Plant. Finally a bee balm that is small and compact enough to fit in sunny nooks and crannies. Pardon Me Pink Monarda is a perennial plant that will delight you with its brilliant hot pink flowers. A nicely fragrant plant that's true pink perennial flowers will attract butterflies, bees and hummingbirds as well as being deer resistant. This pink flowering perennial grows to 10 to 12 inches tall and spreads 10 to 12 inches wide. Space your plants every 10 to 12 inches. Bee Balm Pardon My Pink Monarda facts. Growing monarda near tomatoes in the garden is reported to improve the health and flavor of the tomatoes. Bee Balm is the natural source of antiseptic Thymol which is the primary ingredient of many mouthwashes. Some Native Americans used bee balm as a medicinal to cure skin infections, minor wounds and excessive gas. Pair with our Pardon My Cerise Monarda. 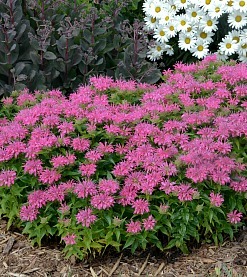 Pardon My Pink Monarda ships in its one gallon Proven Winners pot. Orders shipping to AZ and CA addresses will be bare rooted and root washed before being prepped for shipping.